Schools: See ordering & prices below. within 1-24 hours containing the required information on how to download. Lessons For Life – Practical English Grammar is designed to help you revise and practice your English grammar in a new and exciting way. 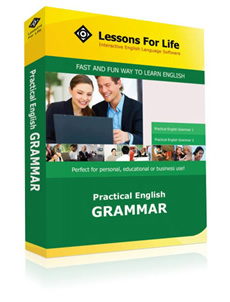 Lessons For Life – Practical English Grammar brings grammar to life with various exercises and tasks. It is fun and easy to use. Each unit presents different fun activities for you to try. Simple and clear explanations help you through the activities, and feedback helps you measure your progress. No matter what your level of English, you will find Lessons For Life – Practical English Grammar useful, entertaining, and challenging. Lessons For Life - Practical English Grammar will help you learn or improve the English language skills you need to optimize your TOEFL/TOEFL IBT, TOEIC/TOEIC IBT, EILTS scores and succeed in education and business. It can be used independently, as part of a course of study, or as a supplement to any level of English language study. Australian schools may purchase on 14 day account. International schools are required to prepay by credit card. If required, see more ordering information here. Thank you. This program does not network.